Has a stadium ever fallen more silent than when Matt Stairs launched that tracer into the right field seats? Has a late-season pickup ever been more underrated than the one Phillies GM Pat Gillick made of Matt Stairs down the stretch? This just in: Pat Gillick knows what he's doing. And, oh by the way, the Phillies are one game away from the World Series. Game Four of the NLCS was an emotional roller coaster. But just as they did all season long, the Phillies staved off a tidal wave of Dodger momentum, and in the blink of an eye converted a two-run deficit into a two-run lead, courtesy of the long ball. Chicks did the long ball. So does most of Philadelphia right about now. If the position in which the Phillies find themselves—back-to-back division titles, 3-1 lead in the NLCS—doesn't vindicate this team, than the perceived anti-Philadelphia bias is absolutely true. Except for a few analysts, everyone—and I mean EVERYONE—is talking about the Dodgers failings and not the Phillies success. 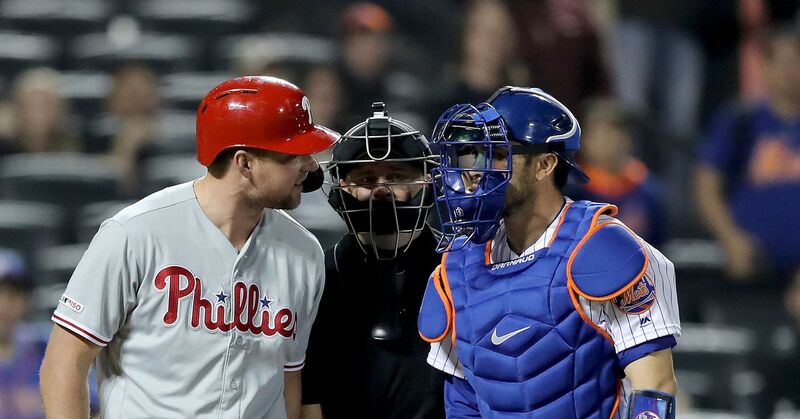 Last season, it was the Mets historic collapse and not the fact that the Phillies tracked them down. This season, it was Mets collapse 2.0. In the NLDS, it was all CC Sabathia, all the time. The NLCS is Mannymania. As much as it ticks off Philly fans like myself, I think the team relishes the role. In a championship-starved city, expectations are often suffocating (see Flyers, Eagles). This team doesn't seem to notice the solitary World Series flag hanging out by Ashburn Alley. As I've written before, fans have a very uncharacteristic optimism. We aren't talking about ghosts of failures past, although the irony of a former Toronto Blue Jay striking the killer blow last night was palpable. Instead, they're saying things like what my brother texted me during the eighth inning drama last night. "54 [Brad Lidge's number] is 45 [Tug McGraw's number] backwards," he texted. "Ya gotta believe!" The Phillies send their ace to the mound Wednesday night with a chance to claim their first pennant in 15 years. And should they arrive in the World Series, they won't be the story there, either. It will be either the worst-to-first Rays, or the trying-to-repeat Red Sox. And the Phillies wouldn't have it any other way.